The musician, singer, and composer from California with his distinctive voice is already well-known in the Czech Republic, especially after the recent collaboration with Czech rock violinist Jan Hrubý. From the start of his career he impresses with his original songs and lyrics, the poetry of which reflects his rich life experiences. His music catches the Californian sunshine and the influences of his musical heroes. The songs composed from this blending, enthrall the most fastidious music lovers. One of the artists who has influenced Jesse Ballard‘s music the most is without a doubt Mr. Ray Charles. At the "Europe Blues Train 2018“ he will present a variation of the program, "An Homage to Ray Charles". On the piano we will hear Stephan Hoppewhose Ray Charles style piano playing has already impressed audiences in many places. The trio will be sensitively completed by Joe Kučera (sax, fl), musical partner and friend of Jesse since the 1970ies and also the one to initiate this special programme which is performed since the beginning of this century in many places around the world. 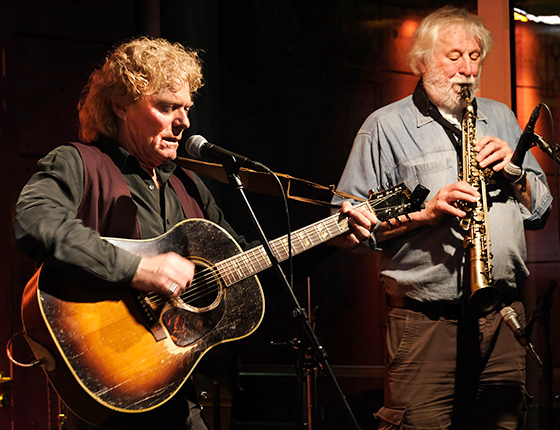 As kick-off at Kulturcafé M, Jesse & Joe will play a programme with most popular and fancied songs of the Jesse Ballard repertory.